The Scout/Guide Friendship Camp in Bhutan was attended by over 500 boys and girls hailing from all the seven SAARC countries - Bangladesh, Bhutan, India, Maldives, Nepal, Pakistan and Sri Lanka - during which the youngsters developed a remarkable sense of friendship and solidarity. Madanjeet Singh's message at the inauguration of the First SAF -Scout Friendship Camp in Bhutan (21st - 26th February 2002). 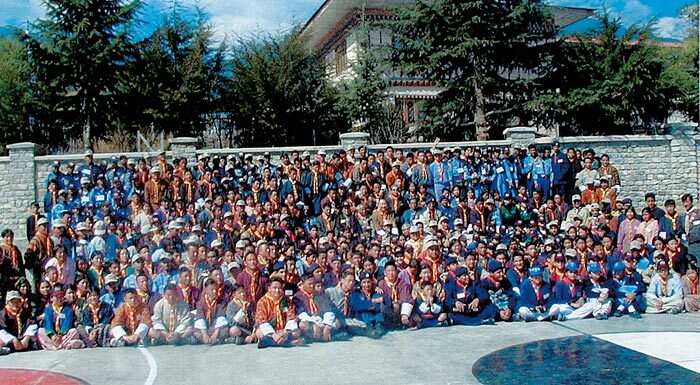 The First SAF-Scout Friendship Camp in Bhutan (21st - 26th February 2002) is the most important landmark event of the South Asia Foundation, a secular, non-political, non-profit organization striving to create a youth movement of regional cooperation through people to people contacts both in rural and urban societies of SAARC countries. Dedicated to education and development, it embodies the ideals and spirit of its raison d'être by reaching out to young people such as the scouts and girl guides participating in this event for it is above all their future and welfare which is at stake. Among the significant steps which the SAF has taken to promote regional cooperation and development is to launch a Community Email Service (rainbowsaarc.org) which will allow unlimited interaction among scouts and girl guides participating in the Friendship Camp for the next year. They will be able to use this free-of-cost facility to write essays and stories about their joint experiences during the camp and even after they go home. The best essays and stories will be rewarded by inviting the winners to participate in the next Camp, as the SAF Scouts Friendship Camp in Bhutan is the first of a series of annual events in SAARC countries. Another important decision taken at the Kathmandu SAF Conference (11th - 12th December 2001), was to start a series of documentary films on the theme of regional cooperation and development, based on South Asian cultures. Unlike some other cultures worldwide, we in South Asia believe that civilization is not only solid and external. It's people's dream, their imaginative interpretation of human existence, their perception of the mystery of human life. Inspired by these ideals, scouts and girl guides will do well to jointly build a world in which people love reason, shun the darkness of violence, turn towards the light of peace, despise meanness and vulgarity, praise the virtues of cooperation - a world with people whose minds are sensitive, hearts generous and spirits free. It is against this backdrop that Ekushey TV in Bangladesh, is making the first documentary film in collaboration with Bhutan and with other SAARC countries to be shown not only on South Asian TV channels but also internationally. May I also take this opportunity to heartily thank the Honorable Minister of Education, Lyonpo Sangay Ngedup, and through him his colleagues in the Bhutan Government for the initiative they took some two years ago to propose and then organize so efficiently this first SAF Scout Friendship Camp in Bhutan. I must also express my gratitude to all the SAF Chairpersons, Scouts Associations in SAARC countries and others for having taken such a keen interest and making this event a great success by sending 500 very bright young scouts and girl guides, dedicated to working for regional cooperation and peace in South Asia. The Friendship camp, a brainchild of Ambassador Madanjeet Singh and Lyonpo Sangay Ngedup, Chairman of the SAF (Bhutan) was envisaged early last year. Mr Kiniey Dorji, the Camp chief and advisory board member of the SAF chapter in Bhutan then started the year long preparations for this mini SAARC summit where more than 500 young boys and girls came together for a week of interaction and discussion on regional cooperation. The camp was inaugurated by Honorable Lyonpo Sangay Ngedup at the colourful multipurpose hall of the Motithang High School. This hall had been recently refurbished with a grant from the South Asia Foundation. The welcome address by Lyonpo exhorted the young men and women to form new ties and remember them when they themselves would lead their countries in the future. Professor M P Lama, then spoke to the participants and urged them to honor the principles of regional cooperation and communal harmony. He also read out Ambassador Singh's message to the youth which urged them to take their future in their own hands and get rid of the hostility that abounds in the region. Each contingent then made a brief presentation on their respective countries, to inform and educate the gathering on the diversity in the region. On Saturday 23rd February, the Computer Training centre was inaugurated by the Resident Representative of UNESCO in Bhutan. The Internet café was declared open and, as was to be expected, was the centre of attention for a number of people. They were then trained in the use of the SAF portal. Of special interest to them was the email community that was launched on the portal. The Email community allows individual boys and girls to access their own email free of charge. Using this exclusive and fast email service, these young members of the community can interact on a regular basis and exchange views and opinions with each other. This email community should foster an online network of all young boys and girls from the region. Using the email club and the discussion forum on the portal, these boys and girls will also be able to submit their own impressions and suggestions. These would then be vetted and published on the portal. The first such write up was published on the SAF portal in the news and views section on 8th March 2002. This entry, refered by Mr. K K Katyal, chief editor for the SAF portal, was submitted by a young school student in Islamabad. Among the other interesting entries submitted are a number of internet based competitions and a flash film on the friendship camp. All these entries will be graded by the SAF and the prize winners will be awarded with invitations to the second camp, which will be held next year. Another important landmark achieved in this camp was the making of the first documentary on SAF activities. Ekushey TV, Bangladesh’s first private national television network, sent its team to Thimpu to cover the entire event and then make a documentary that will then be released all over South Asia and in Europe and North America. This documentary will comprehensively cover the activities during the camp and send a strong signal to its viewers on the importance of regional cooperation and peace. Similar documentaries will then be made for the SAF. 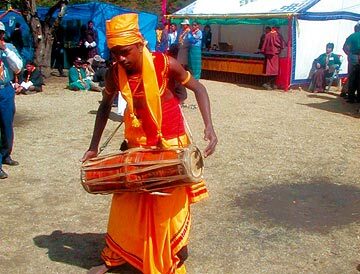 A Sri Lankan drummer student participating to the SAF-Scout Camp, Bhutan (2002). 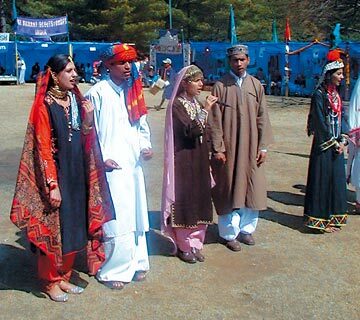 A group wearing traditional costumes from different parts of Pakistan at the SAF-Scout Friendship Camp. The camp, which featured cultural shows and exhibitions, ended on a high note with a farewell speech by The Honorable Lyonpo. He was then requested to formally and symbolically give a thank you Thanka to Ambassador Madanjeet Singh who could not attend the camp due to illness. The Thanka scroll was designed in true Bhutanese fashion by the Chief Commissioner, Sangay Dorji, an artist of repute. All the participants then signed the scroll to endorse their gratitude to the sponsor of the camp. The first friendship camp thus came to a highly emotional end, with all the contingents bidding farewell to new-found friends and resolving to keep alive their new fraternity, cutting across political and cultural barriers.